It was a grand plan. I was going to learn all sorts of new things: Pentaho, R, Processing. All sorts of new things. In the end, I got caught up in getting something done and learned none of those things. Again. I can’t believe Crunchbase didn’t rate limit me* but most of the data is from their excellent database. I augmented it with info individuals have made available on AngelList. I didn’t include any non-public info, even though I know of several excellent angels who didn’t make the map because they’ve kept their activities under the radar. Then, again to make it manageable, I took out any investors with fewer than five investments. Ran it through Fruchterman-Reingold. 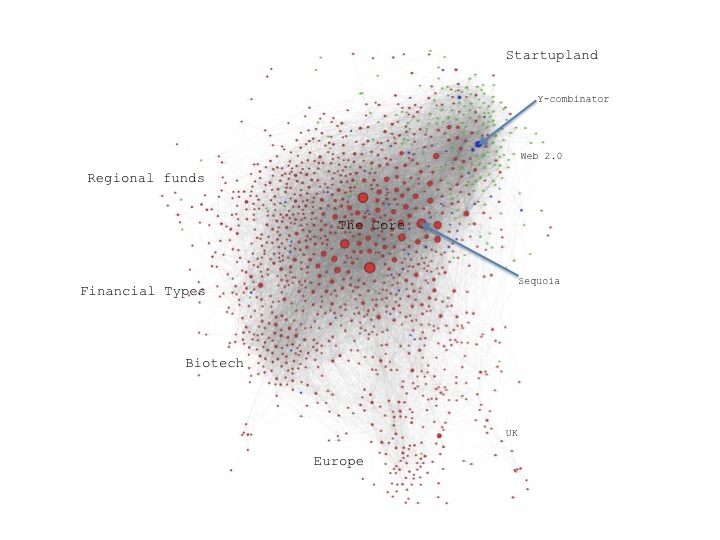 Colored venture firms red, people green and others (corporates, incubators) blue. Made node size proportional to number of investments. – The network is incredibly connected. If you go into the “core”, where the Sand Hill Road firms are, there are so many edges, they are indistinguishable. Generally, in this visualization, the drawn edges are more or less decorative, because there are too many to have them make sense. – Because of the dense interconnectivity, there are not many noticeable subnetworks, from 50,000 feet. Here’s a map key, such as it is, showing some areas that are distinguishable. The separation between biotech and the core is no more noticeable, to my eye, than that between web 2.0 and the core. I do find that the further I get from my own node, the less I know about the investors. I should note the usual caveats. Crunchbase data is not a complete record of investment activity, in fact it tends to be severely self-selecting. I assume both non-US and non-Internet-tech are underrepresented. I know non-VC investment is underrepresented. Also, my few fixes are not all-encompassing. This was a project I had time for because of a couple of long train rides. 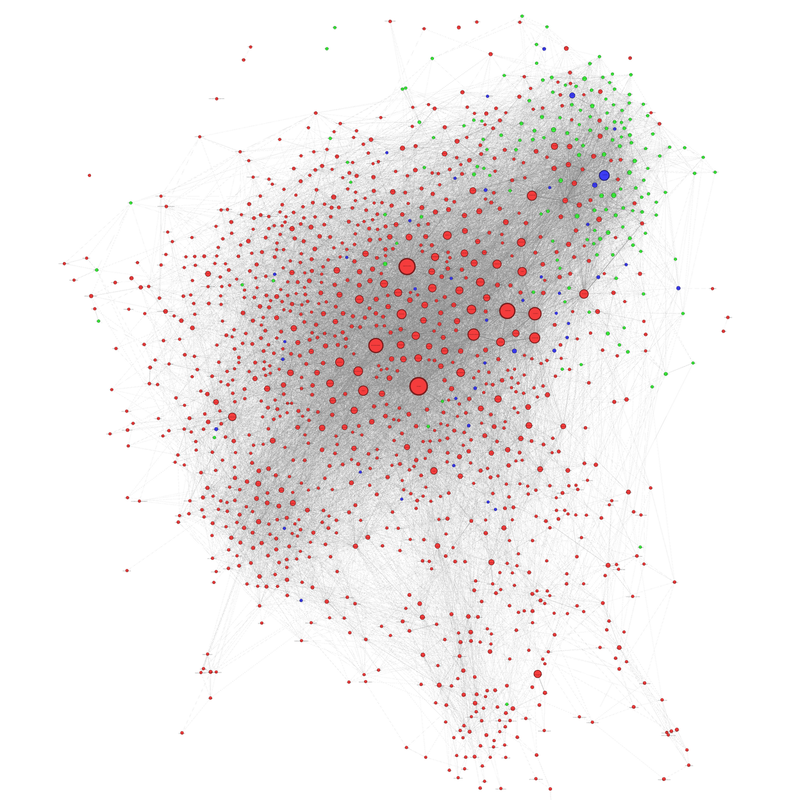 I do have the raw dataset (both gephi, graphml and pickled networkx graphs) for the entire network. If you want them, let me know. Drag and zoom. Find your friends. * Or maybe because I was hitting their API while on the Acela, they figured it couldn’t possibly be programmatic. In any case, to my fellow train passengers, I apologize for hogging the bandwidth. You might find Cytoscape (http://www.cytoscape.org) to be a better network graph tool. this, friend, is how you bridge the gap. Would be cool to see what this looks like for the ad tech world. Does the data classify the type of investments? Would love to play with it if it does. Extantproject–Thanks, will check it out. The main thing I would have liked in a visualization program would be a way to have it be able to export to a format that’s interactive (beyond drag and zoom) in the browser. Seadragon is pretty cool and it looks like it might be extensible to do that (not by me, though…) Does Cytoscape have that capability or is it moving in that direction. Some of the stuff they’re doing at Malariapedia (http://mbw.molgen.mpg.de) is amazing. Want. Would be pretty easy to generate from the database I now have if given a list of companies to filter by. Not sure how much info it would give you, though. It would also be pretty easy to generate with both investors and companies, but it would probably be somewhat similar to my previous foray into data visualization, the chart Brent Halliburton put together with data I generated (here: http://www.adexchanger.com/venture-capital/ad-technology-funding/ ). Happy to share data (the raw data is in a mysql database so if you let me know what format you want it in, it would be pretty easy to generate), or re-run either way if you have a list of companies. Also, to anyone: as I look at the visualization, I wish it had more explanatory power. If there’s anyone out there who actually knows what they’re doing with this sort of thing (this is my first go), I’d be happy to give you data, generate data, whatever. I think that the social network of investors is an important factor in what gets funded and what does not… maybe there’s something to be gleaned from it. Hi Jerry – The data visualization you and Brent put together is kind of what I was envisioning. I had not seen that before. A MySQL data dump would work fine. Would like to play around with it with some visualization tools. A mysql data dump won’t work… the connections aren’t there. Contact me (linkedin) and we can chat. You may even contact Linkfluence to negotiate the use of their online graph visualizer (they are sometimes open to such initiatives). Explanatory power: take a look at the online studies made by the Gephi community here! Thanks Sebastian, I’ll check them out. Funny Sebastien was here first :). I’m linkfluence cofounder and we would be interested to work with you on this dataset and may be publish an interactive version of it (like on this map : http://maps.linkfluence.net/blogopole/2009/). I am a first year PhD student in economics and finance and am working on a research project on financial networks and am looking for data sources…so I would definitely be interested in the data! I am also a Python newbie, and have found it to be both incredibly useful and fun to play around with…I am very much interested in improving my Python data analysis and visualization skills. btw, I assume that you have encountered iGraph tools for network visualization/analysis before? Happy to share. Let me know what you want and how to get it to you. There’s a lot more data than was represented in the graph posted. I believe I tried iGraph (python) a year or a bit more ago. Managed to overwhelm my puny little macbook pro because the graph was too big. That’s why I was excited to find networkx, it’s pretty lightweight, it seems. At least, it worked. Also, based on your post I checked out Gelphi…very nice! Let me know how to contact you and we can discuss what fields you want, etc. Thank you so much for publishing all this amazing work! I would be most grateful if you could share with me the gephi file or the raw data. You can find my email address on LinkedIn – happy to connect with you. Try running Kohonen self-organizing map to find hidden patterns. Alternatively subtractive clustering algo could do the same thing but less graphically that Kohonen.